A black and white rendition of this young polar bear approaching the camera. Arctic National Wildlife Refuge, Alaska. Sometimes I wonder if anyone’s still here. These days, when I do blog, it’s mostly over at Expeditions Alaska. I definitely recommend you check it out over there, if you’re interested, and click on the “Get It By Email” link to stay connected and updated with all the goings on. I simply found keeping a couple blogs going not worth the time. Maybe I’ll post here from time to time when I get bored, LOL. Anyway, here’s a polar bear photo from this past fall. We spent a couple weeks in the arctic, again, and had some great photography opportunities with the bears. Never ceases to amaze me how fascinating it is to observe and photograph these incredible creatures. 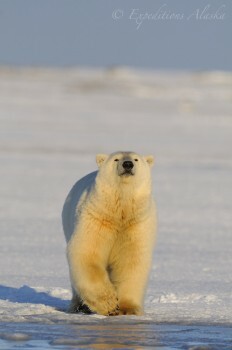 I’ve never really found another animal quite like the polar bear. I converted this photo to black and whit to see how ti might come out and was pleasantly pleased with the results. What do you think? This entry was posted in Alaska, ANWR, Polar Bears, Wildlife and tagged black and white, Ursus maritimus on November 29, 2017 by Carl D.
One fat young polar bear cub, sitting back on his haunches, totally chilling. It’s great to see a happy polar bear. Please click on the image above to view a larger version of this photo. Just thought I’d wrap things up for the year with another polar bear photo. This one I took a couple of years ago, but I ran across it this evening doing some editing and so on and thought I’d post it. I just love the pose and feel of this shot. 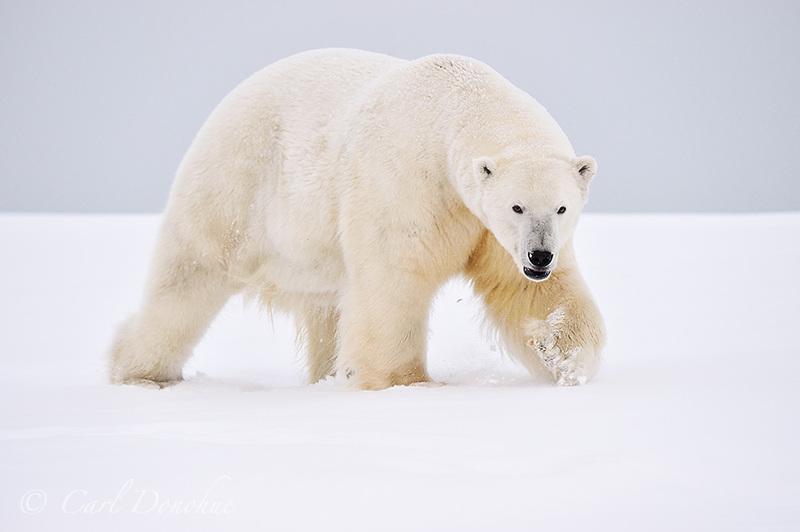 Due a cancellation, I have some space on my 2016 polar bear trips. Please let me know if you’re interested, the few spots for this trip typically fill up early. Hope you all had a good year, and wish you all the best for the holiday season and the coming year. This entry was posted in Alaska, ANWR, Polar Bears, Wildlife and tagged Ursus maritimus on December 23, 2015 by Carl D.
I thought I’d share this video on my site here. I wrote the tune, a number of years ago, and recorded it with some friends in Atlanta, GA, when I lived there. Great musicians all of them, and it was a treat to record with them. I played the guitar parts. 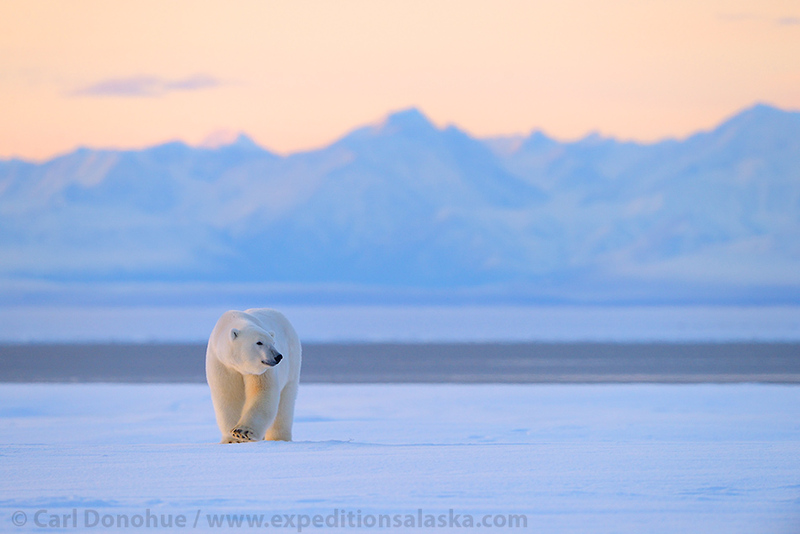 The video and stills I shot in 2013 on my Alaska Polar Bear Photo Tour in the Arctic National Wildlife Refuge. One or 2 of the clips were shot by clients on the trip, and thanks go to Sue P and Munir K for their permission to use their clips. 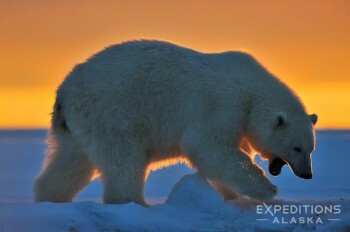 See my collection of stock polar bear photos here. This entry was posted in Alaska, ANWR, Music, Photo Tours, Photography, Polar Bears, Videos, Wildlife and tagged Expeditions Alaska, Ursus maritimus on February 3, 2014 by Carl D.
A young polar bear on the prowl, silhouetted against a colorful sunrise, on the frozen ground of the Arctic National Wildlife Refuge (ANWR), Alaska. Polar bear, Ursus maritimus, Alaska. Please click on the image above to view a larger version of this photo. Everyone loves a great sunrise or sunset, right? And everyone loves polar bears; seriously, does anyone NOT love polar bears? So who loves the 2 together? We set out this morning with high hopes, clear skies and the beginning of color on the horizon. Everyone hoped for a nice sky and some polar bear activity. Hoping, and getting are two different things. So how does it play out? The sunrise turned out to be, in a word, spectacular. The morning itself, frustrating. 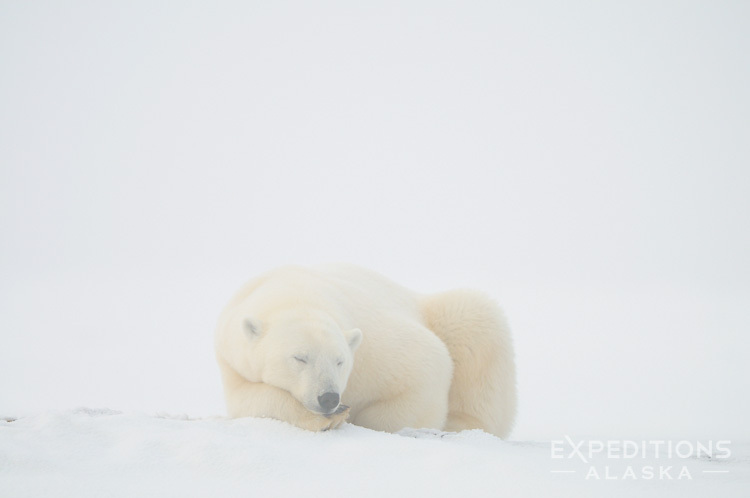 This entry was posted in ANWR, Photo Tours, Polar Bears, Wildlife and tagged Arctic National Wildlife Refuge, Ursus maritimus on January 31, 2014 by Carl D.
A polar bear sleeping in whiteout conditions, on the snow covered ground of Alaska’s Arctic National Wildlife Refuge. Polar Bear, Ursus maritimus, ANWR, Alaska. Please click on the image above to view a larger version of this photo. A quick post for while I’m gone; given the current weather most of the readers in the Lower 48 states are experiencing, this one might be somewhat apropos. A polar bear, sleeping in a snowstorm. See folks, it really isn’t that bad. 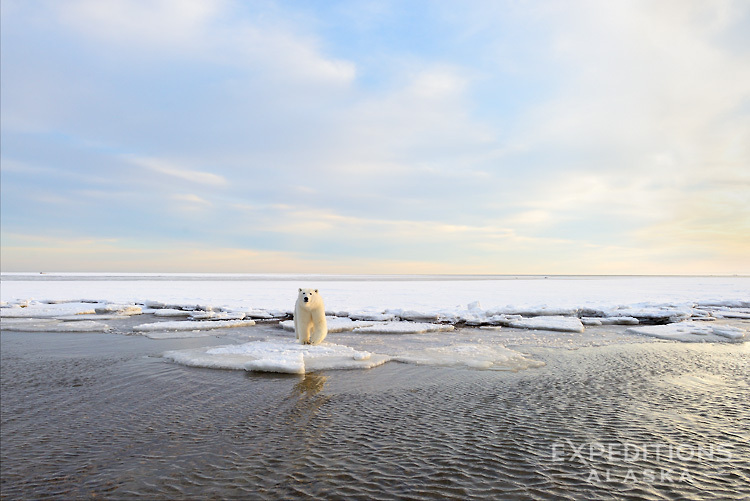 This entry was posted in Alaska, ANWR, Photo Tours, Polar Bears, Wildlife and tagged Ursus maritimus on January 20, 2014 by Carl D.
Standing on thin ice a polar bear curiously approaches. 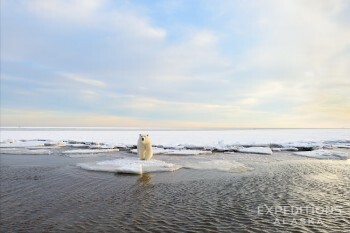 Polar Bear ice, in the Beaufort Sea, Arctic National Wildlife Refuge, Alaska. Please click on the image above to view a larger version of this photo. 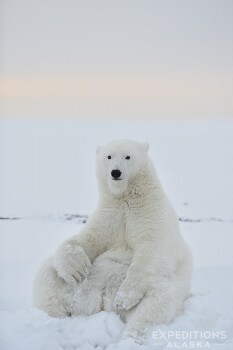 Here’s a polar bear photo from my trip to the arctic last month. Given the predicament bears in the Beaufort Sea find themselves in (declines in accessible food due climate change), I thought the image a particularly relevant one. Polar bears are classified as marine mammals, not, like their darker coated brethren to the south, mammals who earn their living on good old terra firma. Polar bears hunt, almost exclusively seals, and particularly 2 species of seals; primarily ringed seals (Phoca hispida) and less often, bearded seals (Erignathus barbatus). That alone makes polar bears particularly susceptible to population declines; any animal whose primary food source s merely one or 2 other species is somewhat vulnerable. This applies no less to herbivores who may exist on one or 2 types of plants. A crash (or boost) in the abundance of their food source will have an enormous impact on the population of their own species; a look at the lynx and the snowshoe hare cycles illustrates this. So climate change has shifted the world for the polar bear; here’s a quick, and rough, summary of how. 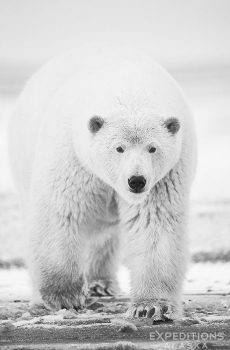 This entry was posted in Alaska, ANWR, Environmental Issues, Polar Bears, Wildlife and tagged Arctic National Wildlife Refuge, Ursus maritimus on November 12, 2013 by Carl D.
Huge congratulations to all those who did so well in the recent BBC and Natural History Museum Wildlife Photographer of the Year competition. Overall winner Greg du Toit has a remarkable image in “Essence of Elephants”. The winners of all the various categories should be proud of some fantastic photography. I saw an interview with Paul Souders, winner of the “Animals in their Environment” category on BBC here. Congrats to Paul for an incredible image, and a great job in the interview. Paul deserves huge kudos for getting out their, on his own, and doing the work. He doesn’t simply trek off to a well known and much favored hot spot and follow the hordes with their long lenses to do his photography. Sure, Churchill is one of the great polar bear photography meccas, but no tundra buggy and over-sized group for his trip. Just himself, his boat and hours upon hours of exploration trying to find a subject; it’s worth noting Paul spent over a week on his trip and saw only 2 polar bears, after spending 12-14 hours riding up to 30 miles a day on the ocean; the first of the 2 promptly raced off never to be seen again. This should be inspirational to so many of us who do this work. We don’t need a dozen bears in the vicinity, and we don’t need to follow the footsteps of the masses and we don’t need to shoot gigabytes of images to make a great image. We need to be creative, diligent and persistent. And, of course, having your own boat doesn’t hurt either! 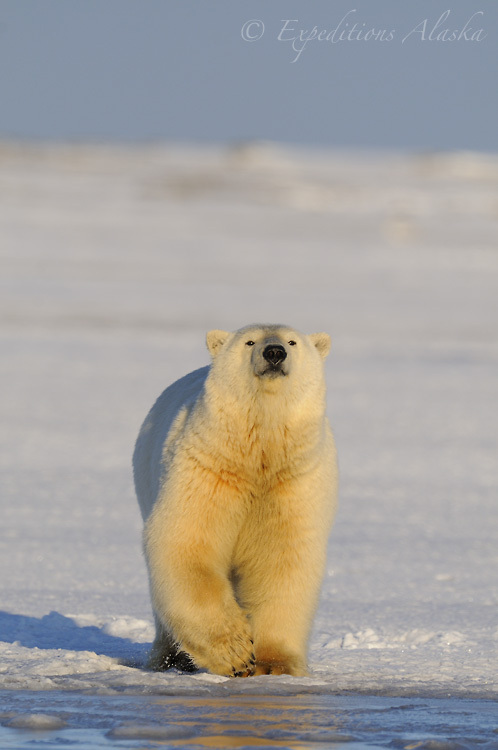 This entry was posted in Adventures, Canada, Cool stories, Musings, Photography, Polar Bears, Wildlife and tagged Polar bears, Ursus maritimus on October 21, 2013 by Carl D.
Polar bear (Ursus maritimus) on a barrier island of the coast of arctic Alaska. Please click the image above to view a larger version of this photo. Recently, a federal judge in Alaska, handed the US Fish and Wildlife Service (F&WS) some homework, when he decided that the agency had been a little overzealous in their designation of critical habitat for the polar bear. In 2010, the Obama administration set aside nearly 190 000 square miles of onshore and off-shore critical habitat for the polar bear. That’s an awful lot of land (larger than the state of California). But polar bears, it seems, are an awful lot of bear. Last month a federal judge ruled that it’s apparently ‘too much’ land. Which is in itself noteworthy, as the judge isn’t really there to decide what’s too much and what isn’t too much land for a polar bear. The judge is supposed to simply review the decision and see whether it follows the law. This entry was posted in Alaska, Environmental Issues, News, Polar Bears, Wildlife and tagged Environmental Issues, Ursus maritimus on February 18, 2013 by Carl D.